Login to your BSNL modem/DSL router typing 192.168.1.1, which is BSNL DSL router IP, on your browser and username : admin. DSL router configuration window opens. On the left hand side of the window, click on WAN in Device Info menu. Check the first row(VPI/VCI - 0/35, Protocol - PPPoE) of the WAN info table displayed. 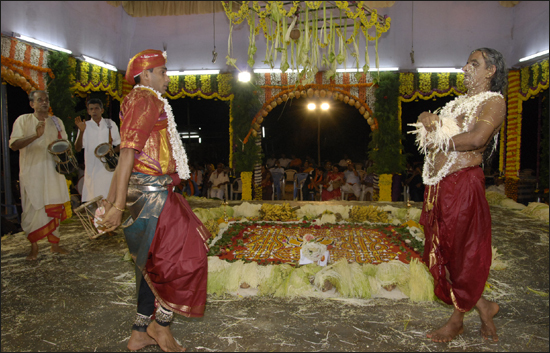 Below image shows the status in normal working scenario. If the username is reset, Status column in this row displays Authentication Failure. 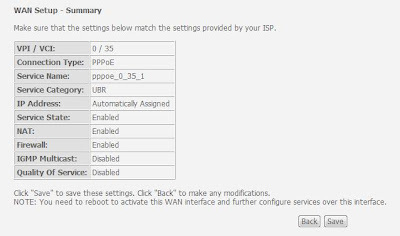 To resolve this error, click WAN in Advanced Setup menu. WAN Setup table appears. First row in this table displays settings for PPPoE(VPI/VCI - 0/35), click Edit at the end of this row. Clicking edit takes you to ATM PVC Configuration window, where you need to make sure that the value of VPI is 0 and of VCI is 35 and UBR Without PCR is selected as Service Category. Click Next button after the changes(if any). After clicking next, Connection Type window appears. 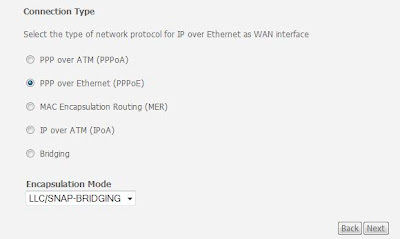 Make sure that PPP over Ethernet radio button is selected and LLC/SNAP-BRIDGING is selected as Encapsulation Mode. Click next. After clicking next, PPP Username and Password window is displayed. Enter your Username provided during installation of the BSNL broadband connection by BSNL guys and password. 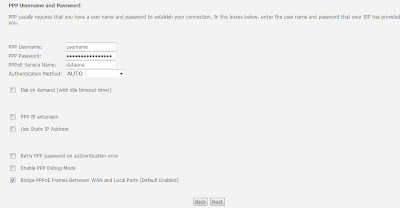 Enter PPPoE Service Name as dataone and select AUTO as Authentication Method. Check Bridge PPPoE Frames Between WAN and Local Ports(Default Method). Click next after that. Network and Adress Translation Settings window appears. Make sure Enable NAT and Enable Firewall check boxes are ticked. In Enable IGMP Multicast and WAN Service, see that Enable WAN Service check box is ticked. Enter Service Name as pppoe_0_35_1. Click next. WAN Setup - Summary window appears which gives the summary of settings you just made. Click on save which opens a WAN Setup window(2nd image from top in this post), where in you need to click the Save/Reboot button for your changes to be reflected. Once the modem/DSL router comes up, you should be able to see Internet LED on that is stable and is not blinking. Now, you should be able to access the net. Note: This problem was showing as Authentication Failure in WAN status previously. Recently, I observed even though WAN status showed PPPoE protocol status as Up, I was not able to access the internet. I found that username had been reset to multiplay and after changing the username, I was able to surf. P.S: The procedure explained above to resolve BSNL DSL Router Username Reset problem, is the one I follow to resolve it in UTStarcom ADSL 2+ Modem/Router, Model No : WA3002G4 got from BSNL. I am not sure whether the same things apply to other DSL Router models provided by BSNL. Also, note that after change the username from 'Multiplay' to yours and reboot the modem, Wireless settings would have been reset, which need to be setup again. Update 10/05/2009 : Fellow blogger Manoj has informed that the same problem occurs in UTSTARCOM UT300R2U modem(Type I), provided by BSNL. This also applies to UTSTARCOM UT300R2U modem(Type I). Thanks Manoj for the info. I used to experience the same problem as you mentioned some time ago, but now frequency of that occuring has reduced. You’ve been here in the blogging world for quite sometime…and a newbie like me would be very grateful if you give me your feedback on my blog. My blog is a record of my life as well as about sharing the things I love.Your feedback would be very valuable. Thanks for the compliments Jyothi. I have visited your blog and have put my comments. great blog dude..keep it rollin .. Interesting... for a while there, I thought my account had been hacked and I was wondering how anyone could access the router confi for this. The router admin login password had also been reset, and the BSNL user was changed to "Multiplay". The router is DNA-211-I. Any precautions I can take? though I had encountered the problem of user name has been reset, I never faced admin login password being reset. So, can't comment much on that. But if you are using your router through wireless(not sure if DNA-211-I has got wireless port), make sure you are using it through secure channel. Dude, Thank you very much... I couldn't access the internet for the last few days due to this issue, and now this post has helped me to resolve it... Keep posting!!! Thanks Aravind, for your feedback on the post. I accidently deleted all rows WAN info table EXCEPT PPPoE row. Soon after that the DSL led went off and i lost connection. now only POWER and LAN led is ON. i tried reset button but i didnt get any indication that it is reset. Please advice. The reason he couldn't get to 192.168.1.1 was because I have Linux as default OS and the browser searches this IP over DNS, returning failure. i would just like to ask u 1 query which i have..
my internet frequently gets disconnected (say in every five mins) even when the dsl lamp does not start blinking.. tried to contact the BSNL exchange but they are damn too slow and also are not able to solve my problem.. if u could help it would be great..
i bought type2 modem 1 month back and now i am experiencing the same situation after resetting the modem. I am not using BSNL connection these days. So, I don't know what is the model you are using as I have seen router models keep changing. From your description, it appears that you want to find uname and pwd, which you can find out calling BSNL customer care/office. Thanks for sharing such informative article about how to change BSNL WiFi Password. Keep on continuing your good work.